Nowadays, the inimitable Sun Ra is regarded as one of the true pioneers of free jazz and a truly innovative and influential musician who pushed musical boundaries to their limit, and sometimes, way beyond. Sun Ra was also a prolific artists who released around 125 albums during a career that spanned six decades. However, since Sun Ra’s death nearly twenty-five years ago on May the ‘30th’ 1993, that number has risen with many more albums and compilations being released. This includes “Of Abstract Dreams” which is the latest exclusive release by Strut and Art Yard which features unreleased radio sessions recorded in Philadelphia in 1974-1975. These recordings are a reminder of the cosmic jazz pioneer Sun Ra at the peak of his powers. His story is a fascinating one. Before dawning the moniker Sun Ra, Herman Poole Blount was born on the ‘22nd’ of May 1914, in Birmingham, Alabama, but very little is known about his early life. So much so, that for many years, nobody knew what age he was. However, at an early age Herman immersed himself in music. He learnt to play the piano at an early age and soon, was a talented pianist. By the age of eleven, Herman was to able read and write music. However, it wasn’t just playing music that Herman enjoyed. When the leading musicians of the day swung through Birmingham, Herman want to see them play and saw everyone from Duke Ellington to Fats Waller live. Seeing the great and good of music play live only made Herman all the more determined to one day become a professional musician. By his mid teens, Herman was a high school student, but even by then, music was his first love. His music teacher John T. “Fess” Whatley realised this, and helped Herman Poole Blount’s nascent musical career. John T. “Fess” Whatley was a strict disciplinarian, and this rubbed off on Herman who would layer acquire a reputation as a relentless taskmaster when he formed his Arkestra. The future Sun Ra was determined that the musicians in his Arkestra to reach his high and exacting standards and fulfil the potential that he saw in them. At rehearsals, musicians were pushed to their limits, but this paid off when they took to the stage. Led by Sun Ra, the Arkestra in full flow were peerless. However, that was way in the future. Before that, Herman’s career began to take shape. In his spare time, Herman was playing semi-professionally in various jazz and R&B groups, and other times, he worked as a solo artist. Before long, Herman was a popular draw. This was helped by his ability to memorise popular songs and play them on demand. Strangely, away from music, the young Herman was very different. He’s remembered as studious, kindly and something of a loner and a deeply religious young man despite not being a member of a particular church. One organisation that Herman joined was the Black Masonic Lodge which allowed him access to one of the largest collection of books in Birmingham. For a studious young man like Herman this allowed him to broaden his knowledge of various subjects. However, still music was Herman Poole Blount,’s first love. In 1934, twenty-year-old Herman was asked to join a band that was led by Ethel Harper. She was no stranger to Herman Poole Blount, and just a few years earlier, had been his high school biology teacher. Just a few years later, and he was accepting Ethel Harper’s invitation to join her band. Before he could head out on tour with Ethel Harper’s band, Herman joined the local Musicians’s Union. After that, he embarked on a tour of the Southeast and Mid-West and this was the start of Herman’s life as a professional musician. However, when Ethel Harper left her band to join The Ginger Snaps, Herman took over the band. This resulted in Herman always being in demand as a session musician. He was highly regarded within the Birmingham musical community, so much so, that he was awarded a music scholarship to Alabama Agricultural and Mechanical University in 1937. Sadly, he dropped out after a year when his life changed forever. In 1937, Herman experienced what was a life-changing experience, and it was a story that he told many times throughout his life. He describes a bright light appearing around him and his body changing. “I could see through myself. And I went up … I wasn’t in human form … I landed on a planet that I identified as Saturn. They teleported me. I was down on a stage with them. They wanted to talk with me. They had one little antenna on each ear. A little antenna over each eye. They talked to me. They told me to stop attending college because there was going to be great trouble in schools … the world was going into complete chaos … I would speak through music, and the world would listen. That’s what they told me.” For a deeply religious young man, this was disturbing and exciting. It certainly inspired the young Herman Poole Blount. After his: “trip to Saturn,” Herman Poole Blount decided to devote all his time and energy to music. So much so, that he hardly found time to sleep. Day in, day out, Herman spent his time practising and composing new songs in his first floor home which he had transformed into a musical workshop. That was where also where he rehearsed with the musicians in his band. Away from music, Herman took to discussing religious matters. However, mostly, though, music dominated his life. It was no surprise to when Herman announced that he had decided to form a new band. However, his new band was essentially a new lineup of The Sonny Blount Orchestra. It showcased the new Herman Poole Blount, who was a dedicated bandleader, and like his mentor John T. “Fess” Whatley, a strict disciplinarian. Herman was determined his band would be the best in Birmingham. This proved to be the case as seamlessly, The Sonny Blount Orchestra were able to change direction, as they played an eclectic selection of music. Before long, The Sonny Blount Orchestra were one of most in-demand bands in Birmingham, and things were looking good for Herman. Then in 1942, The Sonny Blount Orchestra were no more when Herman was drafted. On receiving his draft papers, Herman declared himself a conscientious objector. He cited not just religious objections to war and killing, but that he had to financially support his great-aunt Ida. Herman even cited the chronic hernia that had blighted his life as a reason he shouldn’t be drafted. Despite his objections the draft board rejected his appeal, and things got worse for Herman. His family was embarrassed by his refusal to fight and some turned their back on him. Eventually, Herman was offered the opportunity to do Civilian Public Service but failed to appear at the camp in Pennsylvania on the December ‘8th’ 1942. This resulted in Herman being arrested, and when he was brought before the court, Herman Poole Blount debated points of law and the meaning of excerpts from the Bible. When this didn’t convince the judge Herman Poole Blount said he would use a military weapon to kill the first high-ranking military officer possible. This resulted in Herman being jailed and led to one of the most disturbing periods in his life. Herman’s experience in military prison were so terrifying and disturbing that he felt he no option but to write to the US Marshals Service in January 1943. By then, Herman felt he was on the verge of a nervous breakdown. He was suffering from stress and feeling suicidal. There was also the constant fear that he would be attacked by others within the military prison. Fortunately, the US Marshals Service looked favourably on his letter. By February 1943, Herman was allowed out during the day to work in the forests around Pennsylvania, and at nights, he was able to play the piano. A month later, Herman was reclassified and released from military prison which brought to an end what had been a harrowing period of his life. Having left prison, Herman formed a new band that played around the Birmingham area for the next two years. Then in 1945, when his Aunt Ida died, Herman left Birmingham, and headed to the Windy City of Chicago. Now based in Chicago, Herman quickly found work within the city’s vibrant music scene. This included working with Wynonie Harris and playing on his two 1946 singles, Dig This Boogie and My Baby’s Barrelhouse. After that, Herman Poole Blount worked with Lil Green in some of Chicago’s strip clubs. Then in August 1946, Herman Poole Blount started working with Fletcher Henderson but by then, the bandleader’s fortunes were fading. By then, Fletcher Henderson’s band was full of mediocre musicians, and to make matters worse, the bandleader was often missed gigs. This couldn’t be helped as Fletcher Henderson, was still recovering after a car accident. What Fletcher Henderson needed was someone to transform his band’s failing fortunes and this was where Herman came in. His role was arranger and pianist, but realising the band needed to change direction, he decided to infuse Fletcher Henderson’s trademark sound with bebop. However, the band were resistant to change and in 1948, Herman left Fletcher Henderson’s employ. Following his departure from Fletcher Henderson’s band, Herman formed a trio with saxophonist Coleman Hawkins and violinist Stuff Smith. Alas, the trio was somewhat short-lived and didn’t release any recordings. Not long after this, Herman made his final appearance as a sideman on violinist’s Billy Bang’s Tribute to Stuff Smith. After this, Herman Poole Blount became Sun Ra. By then, Chicago was changing, and was home to a number of African-American political activists. Soon, a number of fringe movements sprung up who were seeking political and religious change. When Herman became involved he was already immersing himself in history, especially, Egyptology. He was also fascinated with Chicago’s many ancient Egyptian-styled buildings and monuments. This resulted in Herman Poole Blount discovering George GM James’ book The Stolen Legacy which turned out to be a life-changing experience. In The Stolen Legacy, George GM James argues that classical Greek philosophy actually has its roots in Ancient Egypt. This resulted in Herman concluding that the history and accomplishments of Africans had been deliberately denied and suppressed by various European cultures. It was as if Herman’s eyes had been opened and was just the start of a number of changes in his life. As 1952 dawned, Herman had formed a new band, The Space Trio. It featured saxophonist Pat Patrick and Tommy Hunter. At the time, they were two of the most talented musicians Herman knew. This allowed him to write even more complicated and complex compositions. However, in October 1952 the author of these tracks was no longer Herman Poole Blount was Sun Ra had just been born. Just like Malcolm X and Muhammad Ali, adopting the name Sun Ra was perceived by some as Herman choosing to dispense with his slave name. This was a kind of spiritual rebirth for Sun Ra, and was certainly was a musical rebirth. After Pat Patrick got married, and moved to Florida, this left The Space Trio with a vacancy for a saxophonist. Tenor saxophonist, John Gilmore was hired and filled the void. He would become an important part of Sun Ra’s band in the future. So would the next new recruit alto saxophonist Marshall Allen. They were then joined by saxophonist James Spaulding, trombonist Julian Priester and briefly, tenor saxophonist Von Freeman. Another newcomer was Alton Abraham, who would become Sun Ra’s manager. He made up for Sun Ra’s shortcomings when it came to business matters. Instead, Jazz By Sun Ra was released in 1956, on the short-lived Transition Records. However, Sun Ra and His Arkestra’s sophomore album Super Sonic Jazz was released in March 1956, on El Saturn Records. Sound Of Joy was released on Delmark in November 1956. However, it was El Saturn Records that would release the majority of Sun Ra and His Arkestra’s albums. The Heliocentric Worlds of Sun Ra Volume 1 was released by Sun Ra and his Solar Arkestra in 1965. Sun Ra had dispensed was the idea of harmony and melody, and also decided there should be no continuous beat. Instead, the music revolved around improvisation and incorporated programmatic effects. This was the case The Heliocentric Worlds of Sun Ra Volume 2 which was released later in 1965. As Sun Ra and His Arkestra came to the end of their time in New York, their music was often described as “avant-garde jazz” or “free jazz.” However, Sun Ra started to reject the free jazz label that was attached to his music. He pointed out that his music had been influenced by different types of ethnic music and he often used percussion, synths and in one case strings. A case in point was Strange Strings which was released in 1967 and found Sun Ra and His Arkestra playing an array of stringed instruments while he adds vast quantities of reverb. Strange Strings was just the latest innovative album Sun Ra released during his New York period, which came to an end in 1968. By then, the cost of living was proving prohibitive and Sun Ra decided to move his band again. During this period, Sun Ra’s music became much more conventional and often incorporated swing standards when they played live. However, still Sun Ra’s concerts featured performances where his sets were eclectic and the music full of energy as they veered between standards and always at least, one lengthy, semi-improvised percussive jam. In the studio, Sun Ra and His Arkestra continued to innovate, releasing albums of the quality of 1970s My Brother The Wind Volume 1, The Night Of The Purple Moon and 1972s Astro Place. However, Sun Ra in 1973 released two classic albums like Space Is The Place and Discipline 27-II. Sun Ra was at the peak of his powers and seemed to have been reinvigorated creatively after moving to Philly. Buoyed by the critical acclaim and commercial success of Space Is The Place and Discipline 27-II had enjoyed during 1973, Sun Ra knew that 1974 was going to be yet another busy year. He was used to this, as Sun Ra and His Arkestra had been working non stop since 1972. They embarked upon lengthy tours and recorded several albums in Chicago, California and Philly. It was more of the same in 1974, with Sun Ra and His Arkestra embarking upon yet another lengthy and gruelling tour of America. Still, Sun Ra found time to prepare a couple of live albums for his El Saturn label, and record a session for the Philly based radio station WXPN FM. The exact dates of the recordings on “Of Abstract Dreams” is unknown, and all that can be said for sure is the they were recorded during 1974 and 1975. During that two year period, it’s thought that Sun Ra and His Arkestra made several visits to the studios of WXPN FM, where Sun Ra’s compositions Islands In The Sun, New Dawn and I’ll Wait For You were recorded. So too was the Lacy Gibson and Alton Abraham composition I’m Gonna Unmask The Batman. These four tracks were recorded by Sun Ra and His Arkestra and although the core band is the same on each track, there’s the occasional change in the lineup. This allows Sun Ra and His Arkestra to create another set whee the music is innovative and groundbreaking. That is the case from the jangling piano that opens this new and previously unheard of version of Island In The Sun that opens “Of Abstract Dreams.” With no bass player present, Sun Ra’s left hand beats out a rhythmic bass pattern on the piano as the fluttering flute soars high above the arrangement as extra layers of percussion are added and thicken the sound. Later, a chant adds to the spiritual quality of this new and previous unheard version of Island In The Sun. I’m Gonna Unmask The Batman finds Sun Ra and His Arkestra fusing the music of the past and present to make the music of the future. It features a rhythmic, melodic sound that is tinged with h swings as a gravelly vocal and harmonies play their part in this raucous version of I’m Gonna Unmask The Batman. Closing “Of Abstract Dreams” is the first studio recording of I’ll Wait For You which featured on Strange Celestial Road. Here it has a much more understated sound with Sun Ra’s piano taking centre-stage and sometimes, even hinting at boogie woogie. Soon, John Gilmore’s tenor saxophone veers between a much more traditional swinging sound to a freer, more avant-garde sound. At one point, cosmic pioneer Sun Ra can be heard unleashing a stream of conscious that includes: “many light years in space,” as the arrangement continues to build. Later, it becomes an inventive free jam before becoming understated, as it draws to a memorable close. For nearly forty years, Sun Ra pushed musical boundaries to their limits, and sometimes, way beyond. He was a pioneer and innovator, but also a perfectionist and relentless taskmaster. With some of most talented, inventive and adventurous musicians of their generation, Sun Ra set about honing his Arkestra’s sound. This paid off with music of the standard of the four tracks on “Of Abstract Dreams.” It’s played by Sun Ra’s Arkestra who like their leader were innovators and musical adventurers. Sun Ra was never content to stand still musically, throughout his career was always trying to reinvent his music. Similarly, he was always looking to reinvent familiar tracks and the original version was merely the starting point. What it became, was anyone’s guess? Sun Ra was forever determined to innovate, and when he reinvented a track. That was the case on “Of Abstract Dreams” where what are now familiar tracks head in a new and different direction. To do that, he combined Egyptian history and space-age cosmic philosophy with free jazz, avant-garde, improv and sometimes a much more traditional jazzy sound that had become part of his music since the end of time in New York. 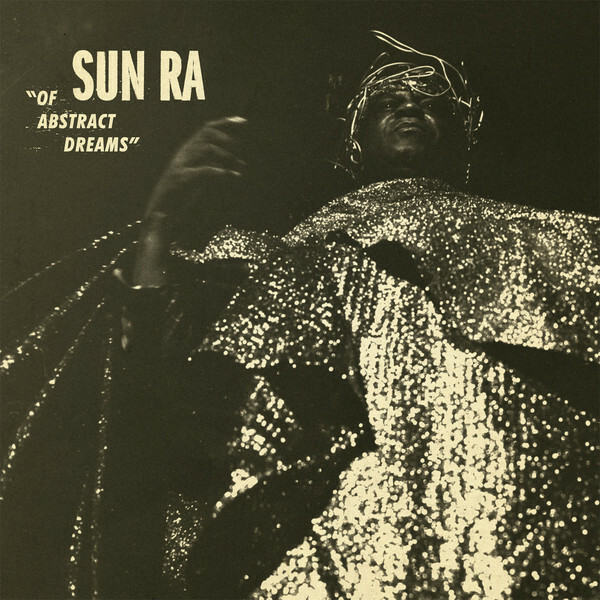 However, still Sun Ra’s music on “Of Abstract Dreams” is unique, inimitable and innovative and is a reminder of a musical legend and cosmic traveller, who sadly, left this planet nearly twenty-five years ago, but left behind a rich musical legacy.